Unlike walls and floors, the ceilings are empty, their entire plane is open and the slightest speck or unevenness of the surface is perfectly visible, especially when there is a side light falling from a chandelier or other lighting fixture. In addition, the ceilings are always in the zone of elevated temperature, humidity and are a place of concentration of dust and other pollution brought up by convection currents. Such operational features put special demands on ceiling paints. 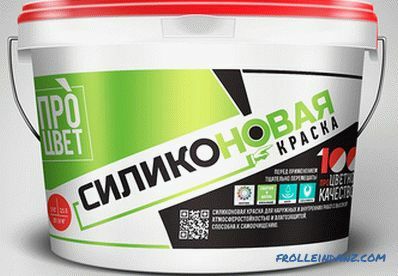 Most interior paints for this purpose are not adapted and will bring nothing but difficulties in work and further exploitation. LKM manufacturers of most brands have a special niche in the line for ceiling paints. But to say unequivocally what kind of paint for the ceiling in the apartment is better, difficult - they usually differ only in some specific properties and for each specific case it is necessary to choose their composition. 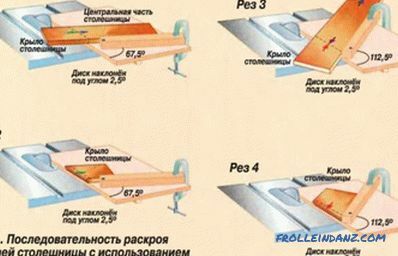 In addition to the price, they are quite different consumer properties, but, again, you can not say which is better and which is worse - each of them has certain advantages in relation to a particular room and ceiling material. 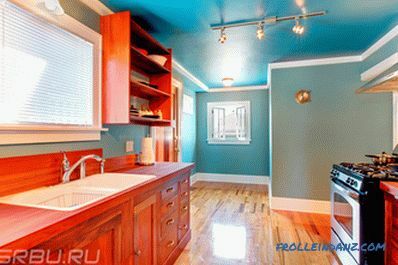 The most popular type of water-soluble interior paints, which are most often used for painting the ceiling. They are based on acrylic resins, their copolymers and a number of other components. Acrylic compositions are produced in the form of emulsions and dispersions - the smallest particles of paint suspended in water. If you look under a microscope, then emulsion paints look like tiny balls floating in water. Acrylic resins do not dissolve in water and it is impossible to mix these liquids by other means. Before use, acrylic paints must be thoroughly mixed so that the particles are evenly distributed by volume. 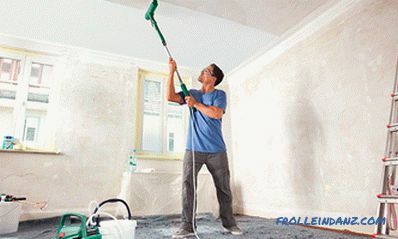 After painting the ceiling, the paint balls are rubbed all over the plane, merge into a continuous film and form a thin, but fairly durable coating. After the water has evaporated, the dye will polymerize and no longer react with water. Acrylic paints are quite elastic and with a change in temperature in the room do not crack and do not form bulges. 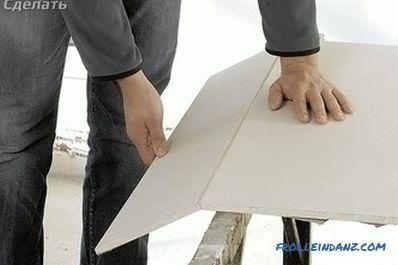 The modification of acrylic ceiling paints is latex. 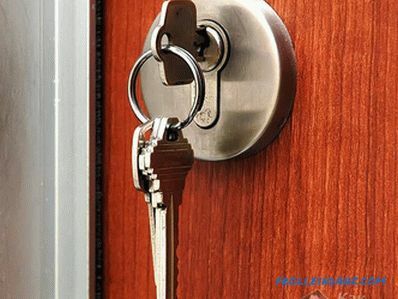 They are created on the same base, but in the composition there are artificial rubbers and other additives, which after drying form a very dense coating, characterized by high moisture resistance, but low vapor permeability. Latex ceiling paints are usually produced in the form of white and snow white compositions with different levels of gloss, semi-gloss and semi-matte are quite popular, they combine all the advantages of latex paints with the requirements for finishing ceilings. But also glossy and deeply opaque paints with latex content are also often used, especially on ceilings with complex relief. The fact is that rubber gives the covering layer a high degree of elasticity, it perfectly bends around any surface and forms a monolithic film on the decor of any complexity. Latex paints are mostly produced on the basis of acrylic copolymers, so it is cheaper without significant loss of quality. But there are compositions without acrylates, only on a rubber basis. But they are very expensive and are rarely used in mass construction and repair. The basis of such paints is liquid potassium glass emulsified in water, suspension of talc, chalk, zinc white (base A) or calcium borate (base AT). After drying, the paint forms a durable waterproof layer, characterized by high vapor permeability. A limitation to the use of silicate paints is their insufficient strength on loose, highly porous, absorbent and polished surfaces. But on mineral bases - plaster, concrete, brick, drywall, they are in some cases better than acrylic and latex, especially in wet areas. But it is not recommended to use them in bedrooms and living rooms. The disadvantage of silicate compositions is their low plasticity - they do not cover microcracks and other base defects. But this disadvantage is balanced by dirt-repellent properties and high resistance to washing by almost any means. In addition, they actively prevent the occurrence of mold and fungus, eliminating the accumulation of moisture inside the ceiling. Even without the use of antiseptics, the risk of spores appearing and multiplying is minimal.The cost can also be considered a plus - silicate paints are in the budget segment and are one of the best in terms of price / quality ratio. 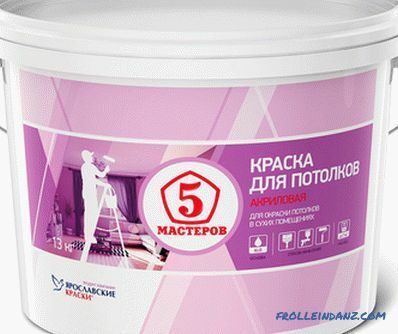 When deciding the better to paint the ceiling, you cannot lose sight of the silicone paints. They are based on silicone resin, but in their pure form they are practically not used as interior paints. Manufacturers actively use their property to mix with acrylic resins and offer compositions based on acrylates with a high percentage of silicones. Such mixtures are highly practical and combine all the positive properties of silicate and acrylic compounds. They are durable, flexible, have a high vapor permeability, waterproof. Also, x is characterized by high resistance to water, elasticity and strength of the finishing film. 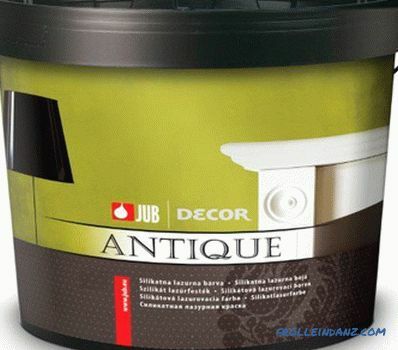 High adhesion to most mineral materials is complemented by excellent compatibility with old paints. They can be applied both on acrylic and silicate paints. 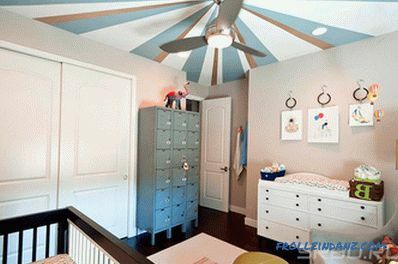 Choosing ceiling paints, you can focus on their luster, water resistance, tinting, cost. But it is best to choose paint for its intended purpose - for the kitchen, living room, corridor, bathroom. 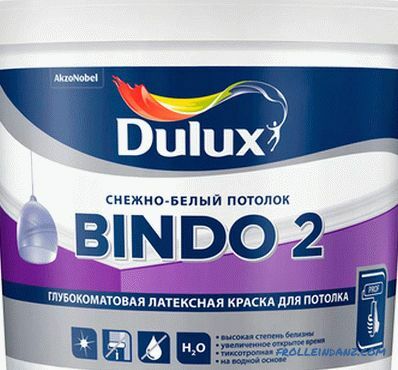 Typically, manufacturers, recommending a particular type of paint for a particular room, have already taken into account the features of operation and have incorporated the necessary components into the paint to improve properties. They are almost identical in composition, except for the components responsible for the surface gloss. For the ceiling it is best to choose paints, ranging from semi-matt level. They perfectly hide small defects in surface finish, tubercles, cavities, traces of tools. And glossy, on the contrary, all defects emphasize, shading them and making them more visible in reflected light. But this does not mean that the glossy paints for the ceiling are not suitable - in many cases they can achieve interesting and useful optical effects, for example, visually increase the size of the room, make it lighter, emphasize the interesting features of the architectural design of the house . In addition, usually, glossy paints are characterized by high moisture resistance and are very convenient when cleaning, allowing the use of active detergents. Traditional white ceilings do not come out of use, but one cannot say that they continue to be at the peak of popularity. More often began to meet the options of painting in pastel and bright colors of different saturation, and even multi-colored ceilings with a combined color, where white or not at all, or it is not predominant. But the choice of the color of the ceiling is not at all arbitrary - there are certain rules by which to choose paint. Most interior paints come to the market in the form of white bases of varying degrees of color saturation - white, bright white, snow white, dazzling white. As a rule, they are tinted in pastel colors or used without tinting. Another part of the colors is offered in a colorless form - they are tinted in all colors, among which are dominated by bright and saturated. If you decide what color will prevail, then you should choose the right base - white color requires more pigment, so this paint will be more expensive. 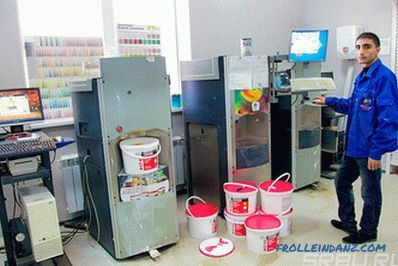 Tinted colors by hand or on special machines with computer selection of pigments. Often the cost of tinting is comparable to the price of white ceiling paint, so count the repair budget for this circumstance. But it is possible to add color to paint manually, before painting, however, it is quite difficult to get into a shade exactly. If the responsible ceiling is painted in the designer interior, do not save on machine tinting. When choosing a paint from a specific manufacturer, try to buy pigments or color-paste from the catalog of the same brand. As a rule, they are developed for specific compositions and may not give the desired effect in a mixture with paints of different origin. Also pay attention to what chemical composition the dye is intended for - pigments for silicone paints are not always suitable for acrylic and are completely unsuitable for silicate. The main rule when choosing a color for the ceiling is that it should be in harmony with the color of the walls, but not merge with them. If this happens, the room immediately loses its shape and there is a feeling of unlimited space, which is not very acceptable in the interior of a residential building. 1. 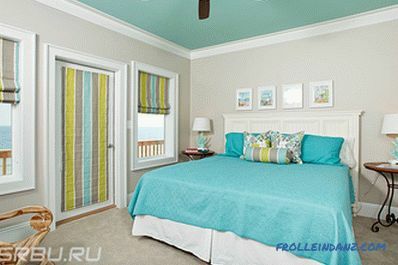 For small rooms with a limited number of windows or without them (corridors, hallways) - blue, white, beige. 2. For the kitchen and dining room - the colors are not too bright shades. The paint is selected waterproof, vapor permeable. 3. Bedroom, living room - calm pastel colors, pure white in semi-gloss or matte gloss. 4. Children - bright cheerful colors. 5. Cabinets - white, cream, beige, in green or blue tones. 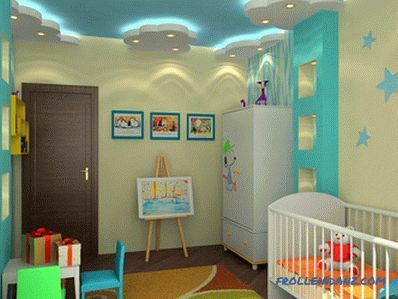 In no case should the ceiling be darker than the walls, although such trends can be seen in the work of some designers. Even in bright light, such a room will create a feeling of heaviness above your head. It is best if the color gradually brightens from the floor to the ceiling, not merging, but not contrasting. The degree of gloss has already been mentioned - matte and semi-matt paints are most preferable in rooms with a normal ratio of height and area. Glossy and semi-glossy are appropriate in small rooms, rooms with non-standard configuration and for solving various special design tasks. Repeat in the statement that choosing the best paint for all indicators is difficult, almost impossible. Each of them has its own advantages and disadvantages. You can only determine the best by one or two indicators. For example, a paint with excellent hiding power and water resistance will be too “fragrant”, while an environmentally safe and vapor-permeable paint is poorly tinted. Therefore, we confine ourselves only to a brief overview of the best manufacturers, with an indication of the advantages of their paints. 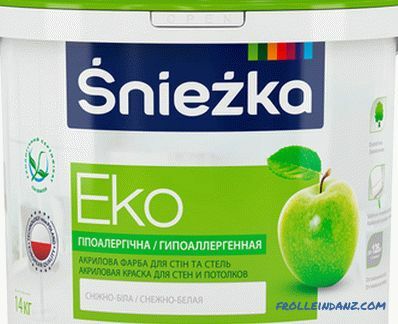 Paints of the Polish manufacturer "Sniezka" are distinguished by their practicality, low price, ease of use. They are available in a wide variety of types and you can find a compound for concrete, drywall, wood, plaster. This allows one paint to cover the ceiling of dissimilar adjacent materials. The "Snowball" paint was appreciated by both professionals and people who use it in everyday repairs. For the family budget there is no better choice than to paint the ceiling, as there is practically no Snow. 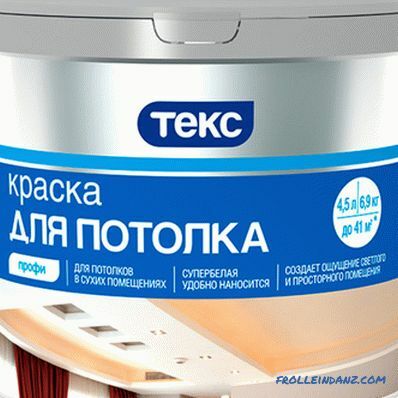 The best paints for the ceiling - a series of "Disney", "Ultra Bel", "ECO". Professional paints of enhanced environmental safety. For the ceilings, special formulations are very convenient, which are pink when applied and become perfectly white after drying. This avoids unpainted areas on the background of a white primer or the first, already dried out layer of paint. In some compounds introduced silver ions, eliminating the appearance of mold and fungus on the ceiling. For paints, Dulux offers a wide selection of dyes collected in the Dulux Color Palette catalog. 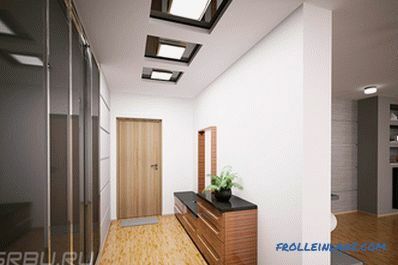 See how the ceiling will look in different lighting can be seen with the help of special computer programs developed by the company. One of the most famous companies in the world of paints. Products of the Finnish concern belongs to the elite of paint and varnish. You can choose paints for any materials that are tinted in the colors of the "Tikkurila Symphony" (20,000 colors), OPUS 1 (2436), Monicolor (2024) and several dozen other options. All paints are of the highest quality and, of course, quite a high price. 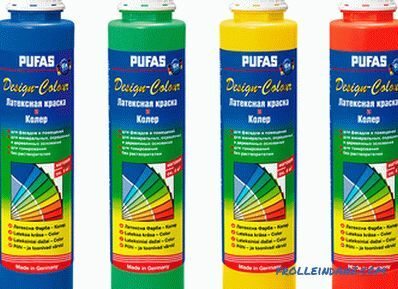 As a rule, paints of the Finnish brand are used in the design repairs for the design of exclusive interiors. 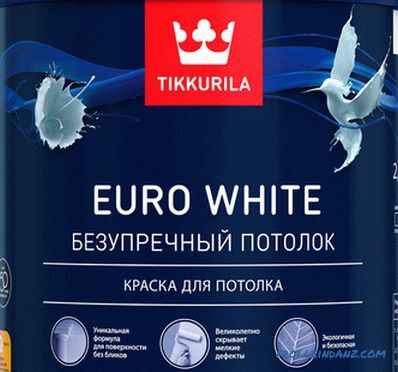 Budget paint of the Finnish concern Tikkurila. 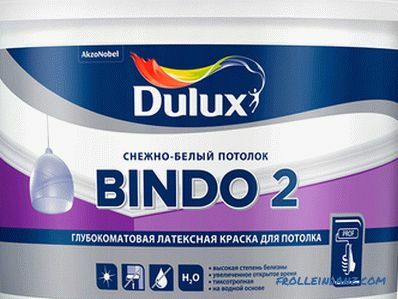 It is made both in Finland, and in Russia for broad use, most often for household repair. They do not require highly skilled builders, but the results from the use of TEX are not too impressive. But at an affordable price, paint the ceiling update every 2 - 4 years is quite acceptable for any budget. Good paint in white and under the tinting in rooms with normal and dry microclimate. For kitchens, bathrooms, offices, it is better to choose paint more expensive. Under the current market situation, the Caparol brand holds very confidently, not inferior in popularity to Snowball and even surpassing it. But the price of this paint is significantly higher. 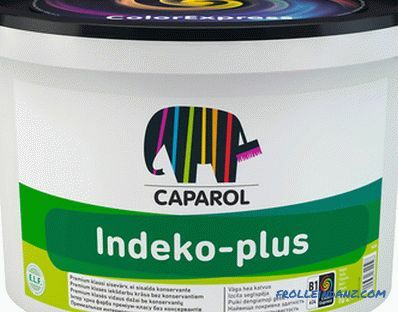 German brand Caparol produces environmentally friendly interior paints for various purposes. 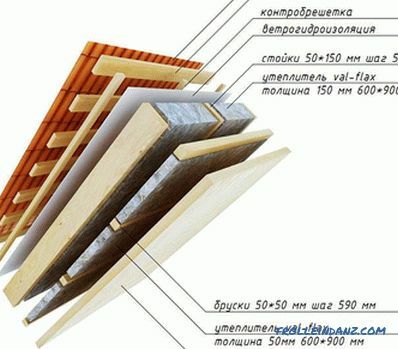 For ceilings, latex and silicone formulations of the CAPASILAN, Indeko-Plus, Samtex and others series are intended. They are perfectly tinted according to the ColorExspress system and are distinguished by durability of the coating and exceptional color fastness.